The body needs an adequate intake of dietary protein to make and repair cells and to support normal growth and development. Protein is found in a number of different types of food. When considering a source of protein, it is important to look at the whole package, says the Harvard School of Public Health. Choosing more lean sources of protein will limit saturated fat intake and decrease a person's risk of heart disease. The Harvard School of Public Health suggests people consume more fish as a source of animal protein in the diet. Fish is high in protein and low in fat. A 3-oz. portion of canned tuna packed in water contains 26 g of protein, 1 g of total fat and 0 g of saturated fat. A 3-oz. portion of salmon contains 17 g of protein, 5 g of total fat and 1 g of total fat. The higher fat content in salmon is due to its higher omega-3 fatty acid content. Unlike saturated fat, foods high in omega-3 fatty acids lower both cholesterol and blood pressure, according to MayoClinic.com. Poultry is another source of lean protein. A 3-oz. portion of white meat poultry is the leanest with 26 g of protein, 4 g of total fat and 1 g of saturated fat. Dark meat poultry without the skin is higher in fat but may still be a better choice than some high fat beef and pork products. A 3-oz. portion of dark meat poultry without the skin contains 24 g of protein, 9 g of total fat and 3 g of saturated fat. Soy is the only plant food containing all of the essential amino acids, making it a complete protein. Animal proteins, such as fish and poultry, are also complete proteins. In addition to being a source of protein, soy foods also provide fiber and omega-3 fatty acids. A 1/2-cup serving of cooked soybeans contains 10 g of protein, 5 g of total fat and 0 g of saturated fat. A 4-oz. serving of tofu contains 9 g of protein, 5 g of total fat and 1 g of saturated fat. Lean cuts of beef include round steaks, roasts, top loin, top sirloin and chuck shoulder. Although it is still recommended intake of red meats, including beef and pork, be limited to 18 oz. per week, according to the Harvard School of Public health. A 3-oz. portion of round steak contains 27 g of protein, 4 g of total fat and 1 g of saturated fat. A 3-oz. portion of lean roast beef contains 24 g of protein, 8 g of total fat and 3 g of saturated fat. Lean cuts of pork include pork loin, tenderloin and ham. A 3-oz. portion of pork loin contains 28 g of protein, 10 g of total fat and 3 g of saturated fat. A 3-oz. 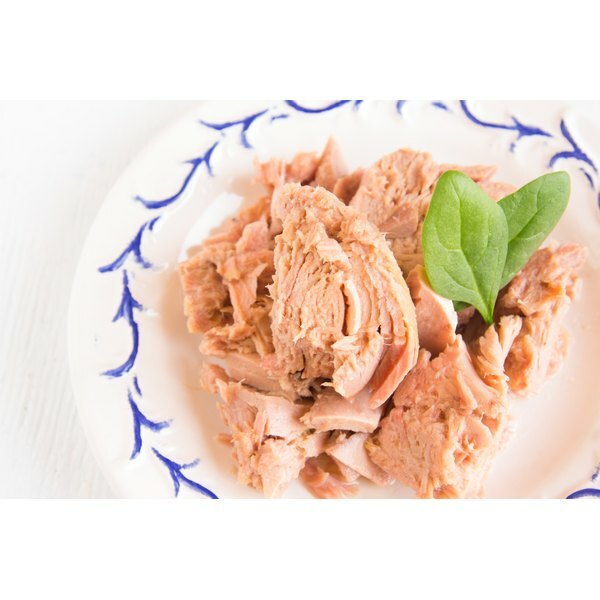 portion of lean ham contains 18 g of protein, 5 g of total fat and 2 g of saturated fat.